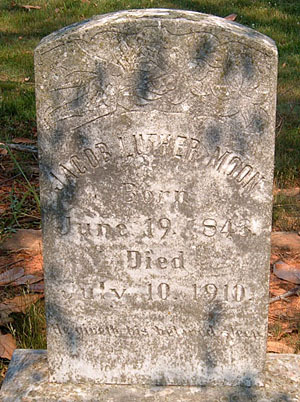 Comments: Jacob Luther Moon was born on 19 June 1843 at Stony Point, Albemarle County, Virginia, and was the son of John Digges Moon, Sr., and Mary E. (Barclay) Moon. 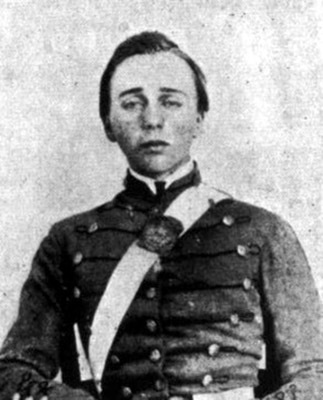 He attended Bloomfield's School in Albemarle County, and on 09 August 1860, Jacob entered the Virginia Military Institute (VMI) as a member of the Class of 1864. He acted as a Drill Master for the Corps of VMI Cadets and was sent to Charlottesville to train new recruits. As the Civil War broke out, Jacob soon became tired of that recruitment assignment and wished for active duty. Jacob was dismissed from VMI on 26 March 1862 for being AWOL for 30 days. At an unknown date, Jacob enlisted as a Private in Company D, 43rd Battalion Virginia Cavalry (Col. J.S. Mosby's Regiment), CSA. Mosby's Regiment became more commonly known as Mosby's Rangers. Jacob proved to be one of the more memorable Rangers. Weighing just 85 pounds, the pint-sized soldier served along with his brother, James Nelson Moon, who was also a Ranger. Together the Moon brothers were known as the "Daredevil Moons." Another of the Rangers, Zack Jones of Scottsville, had his horse shot out from under him on numerous occasions. Once his horse was so badly wounded that Zack could not make it go. His comrade, Jacob, stayed back with Zack and forced the horse along. Zack recalled years later that had it not been for Jacob's actions, he probably would have been captured or killed by the Yankees in that skirmish. At the close of the Civil War, the process of re-integrating Southern supporters into the Union involved signing an oath of allegiance to the United States of America. The first step for soldiers was to surrender and then to sign their paroles. On 25 April 1865, Mosby met his men for the last time at Salem, Virginia, to disband, rather than surrendering to Federal forces, and many tears were said to have been shed. Jacob Luther Moon signed his parole at Charlottesville on 24 May 1865. 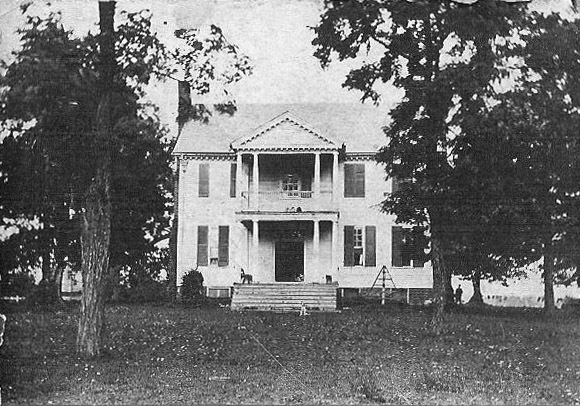 In 1870, Jacob Luther Moon purchased the Stony Point home (see above) from John Schuyler Moon. On 31 October 1871, Jacob married Ann Staples Martin (1845-1906), a sister of U.S. 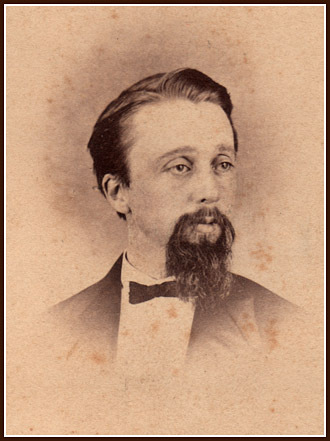 Senator Thomas S. Martin of Scottsville. According to the 1880 U.S. Census, Jacob and Ann Moon were living in Scottsville, VA. 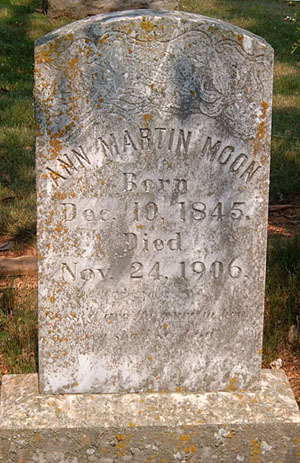 They were the parents of eight children: Anne Staples Martin, Martha Elizabeth (Pattie), Thomas Albert, Jacob Luther, John Martin, Isaac Spencer, James, and Celestine Moon. For many years, Jacob was a banker and merchant in Scottsville, VA. By 1900, Jacob and Ann Moon were living in Richmond, VA. When they passed away, Jacob and Ann were buried side-by-side at Scottsville Cemetery, Scottsville, VA. The 1880 photo of Jacob Luther Moon is part of the Cenie Re (Moon) Sturm collection. Ms. Sturm resides in Scottsville, VA, and is an avid Moon family researcher and dedicated volunteer at Scottsville Museum.